Water that accumulates beneath the surface of the Earth is called groundwater. Contrary to popular belief, groundwater does not form underground "rivers," but is actually found in the small spaces and cracks between rocks and other material such as sand and gravel. Groundwater supplies about 38 percent of the water used for agriculture in the United States. The layer of earth, gravel, or porous stone that yields water is called an aquifer. If hazardous waste, chemicals, heavy metals, or oil collect on the surface of the ground, rain or runoff percolating into the soil can carry these substances into the groundwater. The following activity involves learning how water moves through rock materials such as sand, gravel, and clay. Predict how water will move through gravel, sand, and clay. Which type of material will allow water to pass through it most quickly? Test your hypothesis by filling three different soda bottles or plastic cups to the same level with earth materials - gravel in the first, sand in the second, and clay in the third. The material should fill the containers to a depth of about eight cm. Look closely at each container with the naked eye and with a hand-held magnifying glass. Do you want to adjust your hypothesis after looking at the materials? To demonstrate how groundwater moves through underground rock formations, pour about 120-240 mL of colored water into each container. Record your results and discuss them as a class. Which container emptied the fastest? Which emptied the slowest? How do the different materials influence water movement in natural systems? 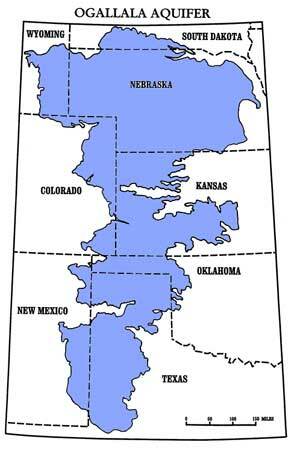 The Ogallala Aquifer (pronounced Oh-Ga-La-La) is one of the largest aquifer systems in the world, stretching across parts of eight states - South Dakota, Nebraska, Wyoming, Colorado, Kansas, Oklahoma, New Mexico, and Texas - and underlying about 174,000 square miles. It is approximately the size of California and contains an estimated 4,000,000,000,000,000 liters of water.